Here's the actual spam they sent me this morning. I'm not really a fan of email marketing. Do you want to know why? I get better mileage using other forms of direct marketing. If I were to run a mail campaign, I'd rather go for snail mail rather than spam. It's more costly, but people these days look forward to getting something in their real life mail box. To get more business from the internet, I'd rather use a combination of paid search and content marketing than to send spam to my target audience. 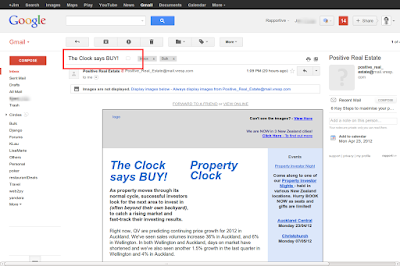 I recently gave my trashmail address to sign up for a real estate webinar here in NZ. At the last moment, they cancelled. They have been sending me spam since. Trashmail automatically creates a disposable email address that will forward all emails to your real address. In this case, I registered with fox_asdfa@trashmail.net. It is set to expire in 30 days, or 10 emails, whichever comes first. In the meantime, I am going to use their spam as fodder for my website critiques. Here is the latest spam that I got from them. The copywriting is lame, if you ask me. It looks like it was written by someone in their office, probably the head of the sales or marketing department. 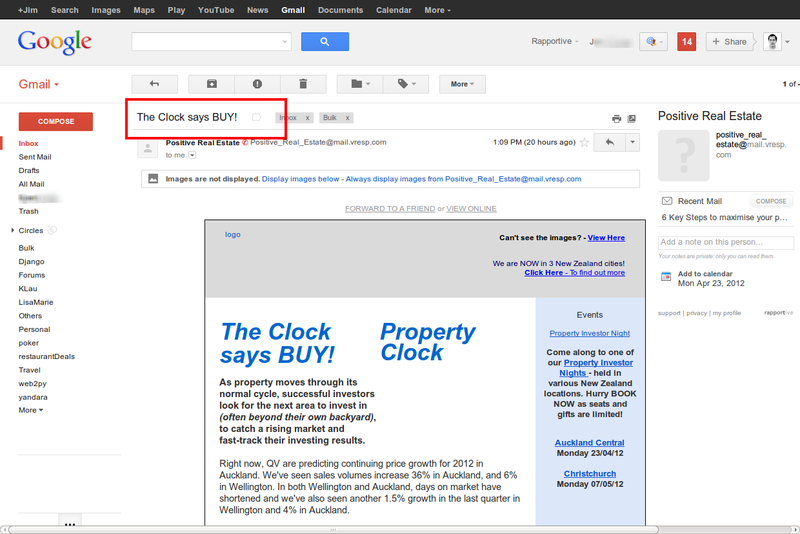 The subject line on my inbox reads... "The Clock Says Buy!" More often than not, the reader's reaction to this is, "So what?" "As property moves through its normal cycle, successful investors look for the next area to invest in (often beyond their own backyard), to catch a rising market and fast-track their investing results". More "so what" copywriting, isn't it? "Right now, QV are predicting continuing price growth for 2012 in Auckland. We've seen sales volumes increase 36% in Auckland, and 6% in Wellington. In both Wellington and Auckland, days on market have shortened and we've also seen another 1.5% growth in the last quarter in Wellington and 4% in Auckland." I made this critique because I found that the rest of their message was well written. They gave enough facts to support their claims, and the writer did not use too much hype. First 5-seconds... if your message fails to hold your prospect's attention, the rest of your message will never be read. To make it work, find out what it is they want, then tell them how to get it.